Common Woods for Custom Cabinets? When you build or remodel your home, you’re making decisions that you’ll literally have to live with, and one of the biggest decision is which wood to use for your cabinetry. There are dozens of factors that have to be taken into account when choosing a wood: the use (or abuse) it’ll be put through, the architectural style of the house, the construction methods of the cabinetry, and – maybe the most important factor – the fact that you’ll have to look at it every day. Budget is always a consideration, of course, but we’ll put that aside in favor of aesthetics. The most popular wood species for kitchen cabinets are cherry, maple, clear alder, and hickory. Other choices include birch, knotty alder, and walnut. Custom cabinet makers like the Artisan Cabinet Company in Chaska, Minnesota, can even place veneers from exotic woods on standard plywood panels to create high-end, luxury case goods in instances where the wood is prohibitively expensive, difficult to find in sufficient quantity, or otherwise unsuitable for construction. Now, there is no way a single blog post can list all of the different options when it comes to cabinet appearance; there are simply too many choices, and everyone’s taste is different. The same wood with the same finish can also radically change its appearance depending on how and where it’s cut from the log. Your best bet is to sit down with your cabinet maker and look at samples. Cherry – Cherry wood is one of the softer woods, but is still very durable. It is very smooth, with a fine grain. One of the more expensive woods, it is known for its warm, rich coloring, ranging from deep red to a reddish-brown. Cherry is light-sensitive, and will darken with age. Maple – Maple is an extremely versatile wood. Different varieties can be soft like cherry or hard like oak. Coloring is fairly consistent across species, generally being a warm light tan. Maple can be stained to almost any shade, and contains mineral streaks that darken when stained. Hickory – Hickory is the hardest wood used for cabinetry. Depending on variety, color can range from pale white to deep brown. All species can be easily stained, and the wood features varying grain, knots, burls, and pinholes. It is one of the species usually used for a “Rustic” appearance. Birch – Red birch has a fine, close grain, between cherry and oak in hardness. Its coloring is similar to cherry, but it doesn’t darken as dramatically over time. Alder – One of the softest woods used for cabinets, alder has an even-textured grain that is relatively straight. Like cherry, its color ranges from light red to a dark reddish-brown. It stains very evenly, and can have knots and pinholes. Walnut – Walnut is a smooth-grained hardwood. Its coloring ranges from deep brown to light reddish-brown, though there may be areas of light yellow or light brown. Unlike cherry, walnut will lighten with age. Oak – Oak is the most popular wood for cabinetry and other furniture. It is a hard wood, relatively inexpensive, and easy to find in quantity. It is extremely durable, easy to stain, and has a very pronounced grain. Color ranges from light tan to dark brown, depending on the variety of oak you choose. Pine – Pine is the other “Rustic” wood. It is very soft, and the least expensive of the top five. It has varying grain, knots, and pinholes. Color is a consistent pale tan, and it stains extremely easily. Now that you have an idea of the characteristics of different woods, you can start thinking about your dream kitchen in terms of durability, consistent staining, panel appearance, and whether you want it to maintain the same color over time. Look through design magazines and cabinetry websites for examples that appeal to you, and share them with your cabinetmaker to help in the selection process. 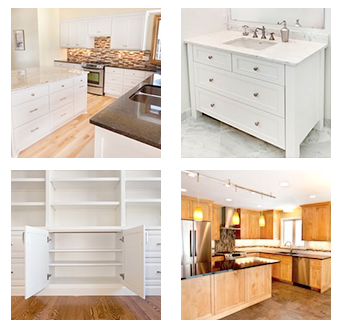 Custom Cabinets: MDF or Plywood?